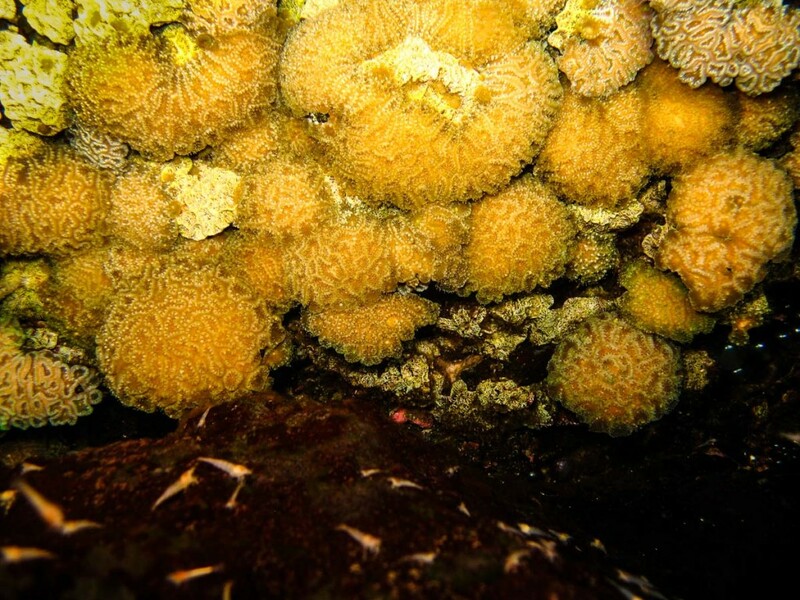 The brooding reef coral Favia gravida (Verrill 1868) is found on the mid-Atlantic volcanic islands of Ascension and St. Helena, about 1,300 km apart. 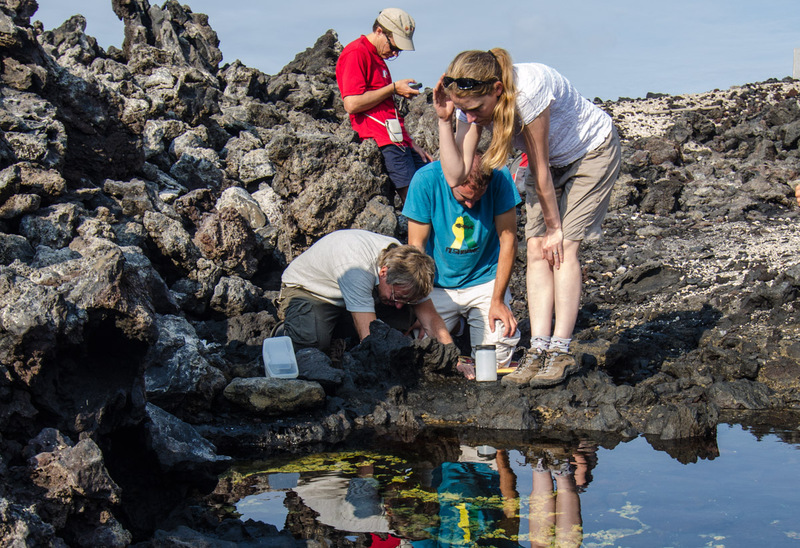 First recorded in 1881 in small tidal rock pools, Professor Wirtz revisited the original site at Shelly Beach, Ascension Island, during the recent SMSG expedition. [caption id="attachment_742" align="aligncenter" width="584"] Peter Wirtz collecting samples from the Shelly Beach rock pools. Although a large number of dead corals were found in the pools, the small population has somehow persisted to the present day. 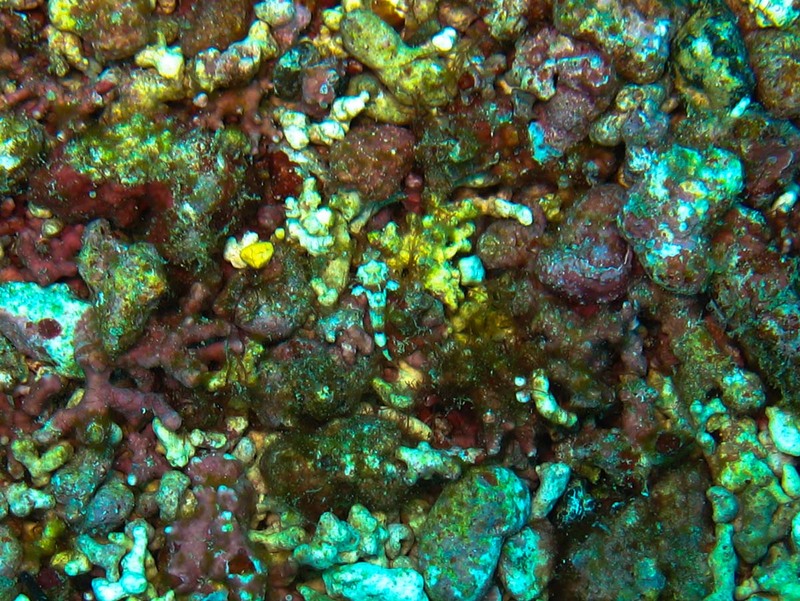 In a new publication, authors Bert Hoeksema and Peter Wirtz suggest that the remarkable survival of Ascension’s small population for at least 130 years has been made possible through inbreeding and fragmentation, suiting it for life on the bottom of these unique shallow rock pools. The full article can be found and downloaded here. Most of the group has now left southward, returning to the Falkland Islands. The remainder will leave tonight northward, to Great Britain - except for our two intrepid plant specialists, who will stay another 7 days. During the expedition, we have recorded literally hundreds of marine species and taken more than 8000 photographs. 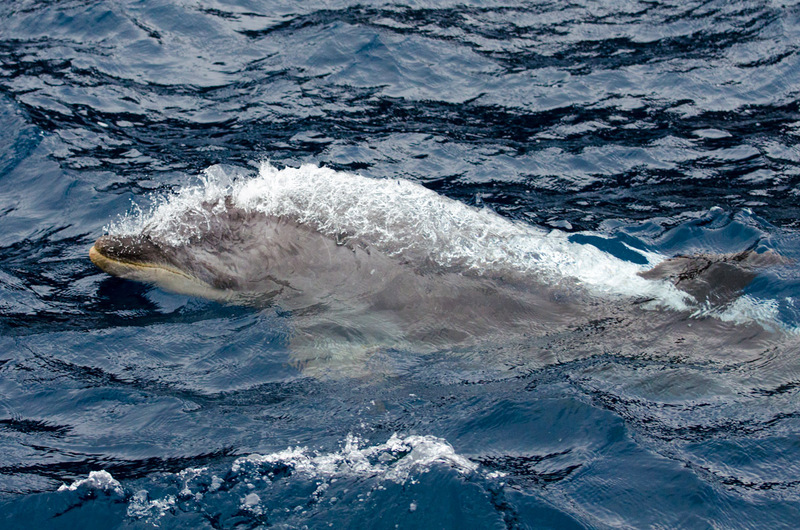 The largest species encountered and photographed was probably a group of bottlenose dolphins that accompanied the boat on the way to Boatswain Bird Island. But it is likely that the fin spotted near Boatswain Bird Island belonged to a much larger animal, a whale shark. Unfortunately, by the time we put on masks and fins it had already disappeared. A mention may also be made of the passing humpback whale several members reported seeing from the shore while filling tanks. The largest creature actually captured was certainly the hawksbill turtle which was tagged, measured and released from Georgetown pierhead. [caption id="attachment_638" align="aligncenter" width="584"] A pod of bottlenose dolphins escorted the team to their dive site near Boatswain Bird Island. 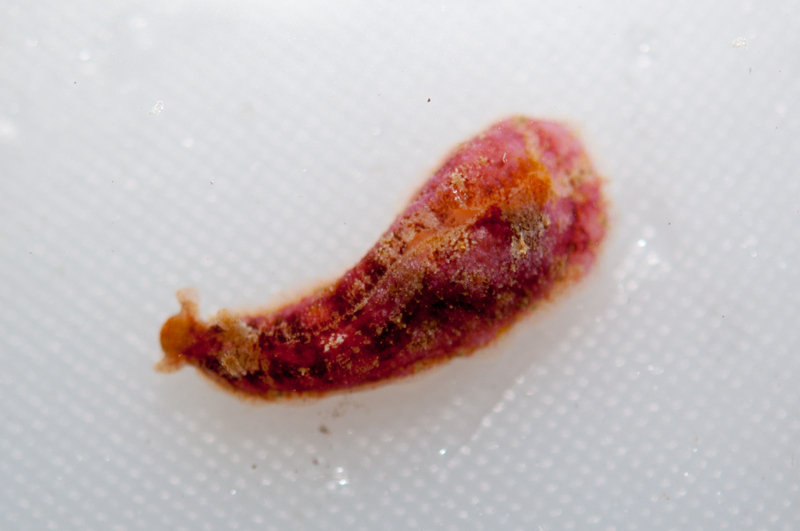 At the other end of the scale, one of the smallest creatures recorded (and captured) must have been a tiny sea slug, belonging to a group called Sacoglossa. It lives on the green alga Bryopsis,where it is perfectly camouflaged. It was first spotted well after a dive while Kostas Tsiamis was examining a sample of Bryopsis under a microscope. Peter Wirtz then managed to find further specimens during subsequent dives. [caption id="attachment_639" align="aligncenter" width="584"] This tiny sea slug is photographed crawling on the fingertip of Peter Wirtz. As illustrated by this image, it's very difficult to tell apart from the algae on which it lives. 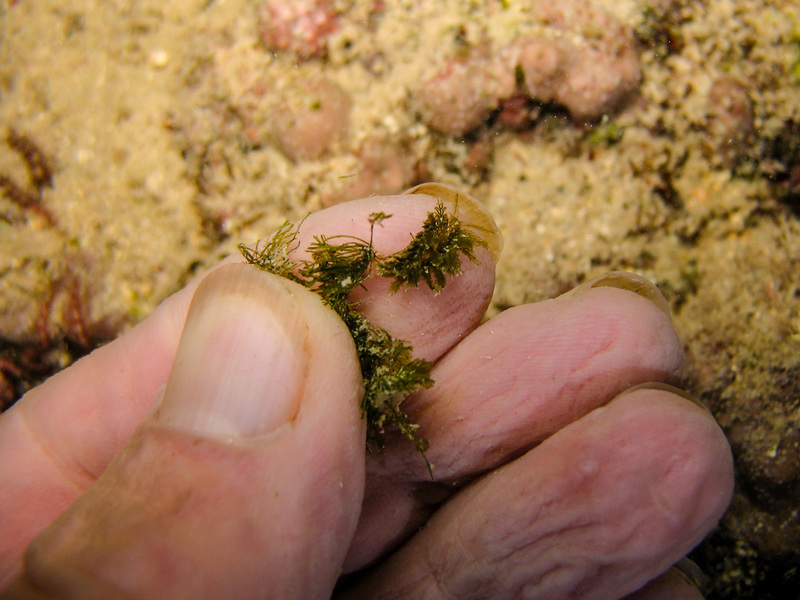 We mentioned in one of our early posts that two of our team members had been fortunate enough to be shown a very special site here on Ascension, the small rock pools at Shelly Beach where two very rare and vulnerable species of shrimp are found. Yesterday a large number of the team enjoyed a return visit to the pools, escorted by Stedson Stroud and Jolene Sim of Ascension Conservation. This time we were loaded with all the equipment we would need for a survey of the site, including underwater cameras, devices to measure salinity and temperature, GPS units to map the site and, most excitingly, special permission by the Ascension Island Government to collect a small number of samples for further study. Enjoy this short gallery of images taken at this exceptional location. 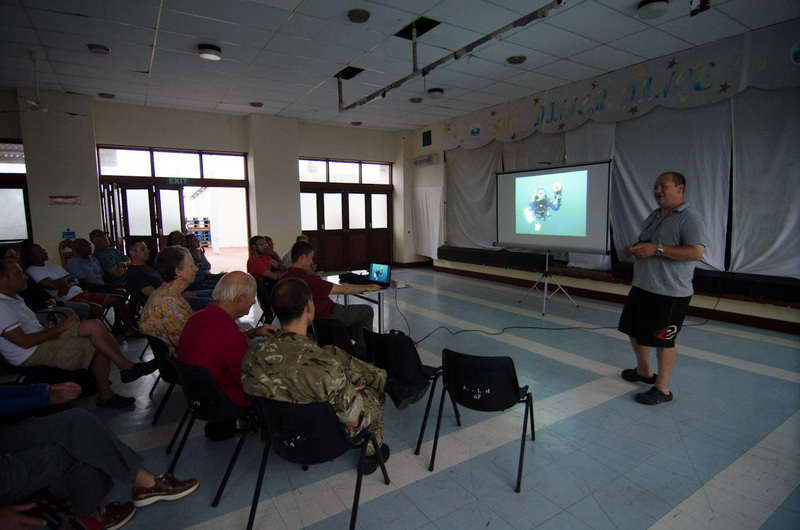 Last night the Ascension Island community were invited to a presentation by the team about their previous work in Falklands and South Georgia, as well as talks about the current expedition. The talk was held in the Saint's Club, here in Georgetown, which is one of the centres of night-life in this small town. It's a great place to unwind at the bar, have lunch or watch a game of skittles! Everyone enjoyed the images of undersea life, some of which have already been loaded to this blog as well as some detailed information about some of the methods we are using to capture some animals for further study. 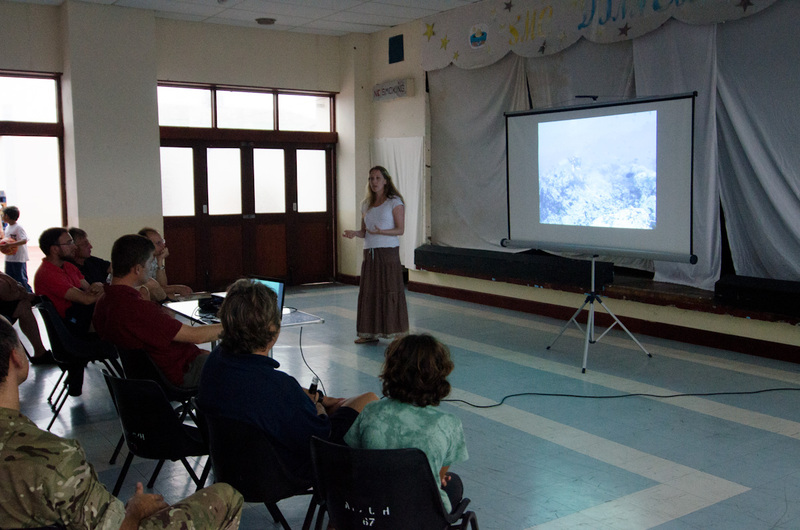 Throughout our stay in Ascension the group has very much appreciated the great interest in the expedition by island residents. 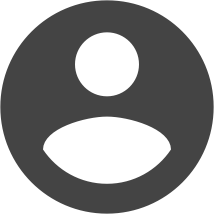 As we reluctantly prepare to leave soon, we remind all that anyone who would like to chat about the project will be most welcome to corner any member of the team while we're still here! 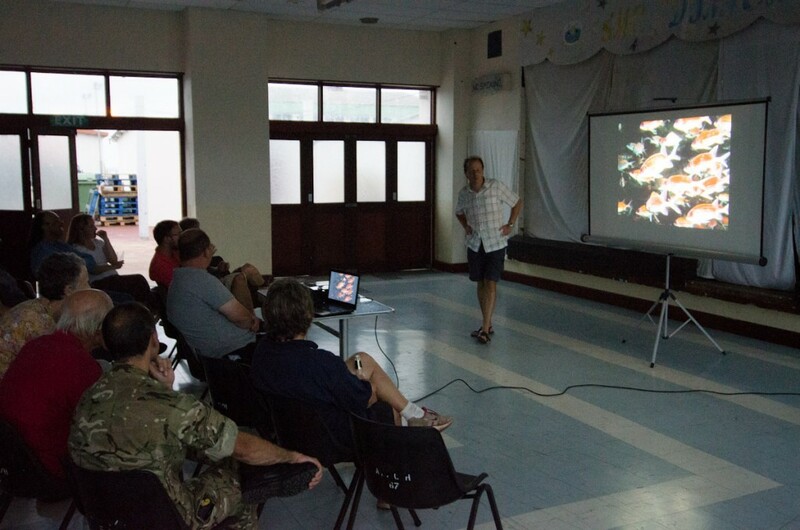 [caption id="attachment_559" align="aligncenter" width="584"] Paul Brickle introduces the talk with some information about the work of the Shallow Marine Surveys Group. 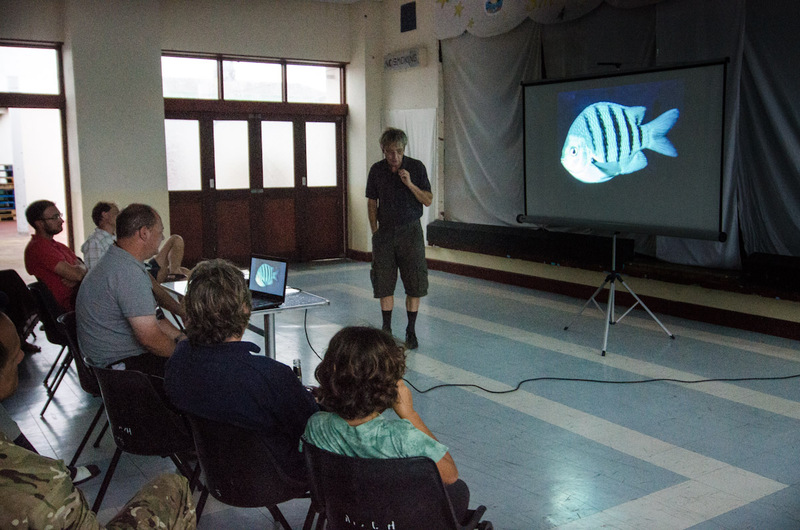 [caption id="attachment_562" align="aligncenter" width="584"] Peter Wirtz entertaining the audience with an impromptu talk about the various animals found in Ascension waters. [caption id="attachment_561" align="aligncenter" width="584"] Simon Morley provides details about his settlement plate experiments. 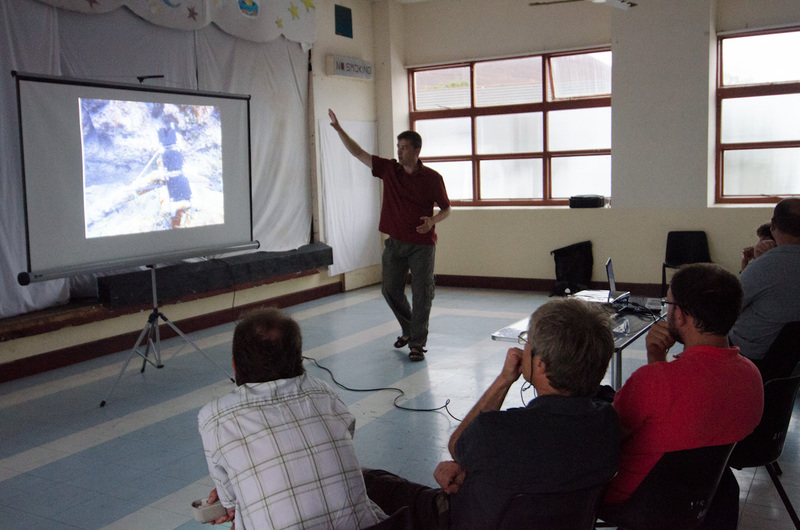 [caption id="attachment_560" align="aligncenter" width="584"] Jude Brown explains the survey methods used by the team to count sealife underwater. 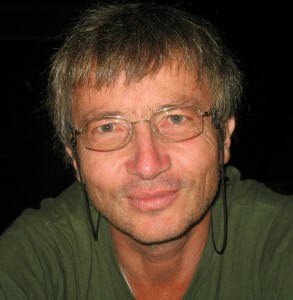 [caption id="attachment_563" align="aligncenter" width="584"] Frithjof Kuepper wraps up the presentation with some information about the search for new algal species. New records are pouring in. With so many divers in the water each day, it is no surprise that new records for Ascension Island are pouring in almost daily. In 1980, Roger Lubbock compiled a check-list of the fishes of Ascension Island. Since then, quite a few new fish records have been accumulated, in particular by island residents and visitors Jimmy Young and John & Jane Bingeman. We are planning to update the fish list and additionally produce a number of publications on the invertebrates discovered during the expedition. 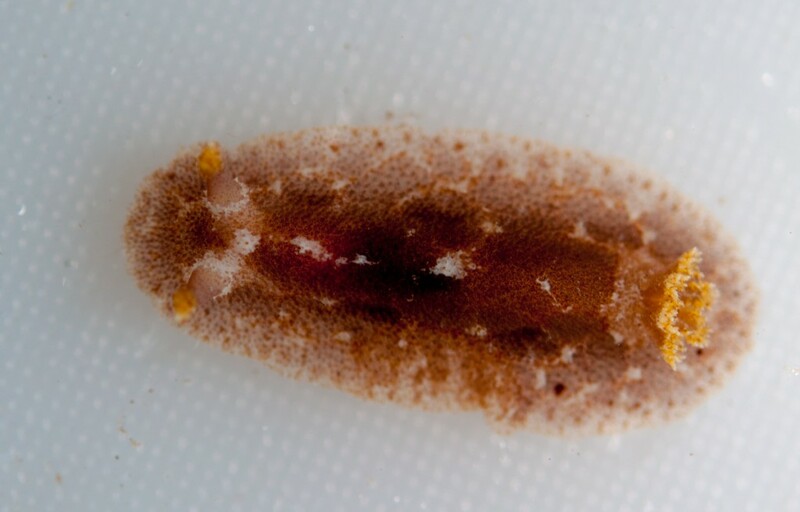 [caption id="attachment_472" align="aligncenter" width="584"] A beautiful brown nudibranch, extracted from the maerl pile accumulated by a tilefish, will have to be sent to an expert for identification. [caption id="attachment_473" align="aligncenter" width="584"] The little sea hare, Dolabrifera dolabrifera, is also new for Ascension Island. 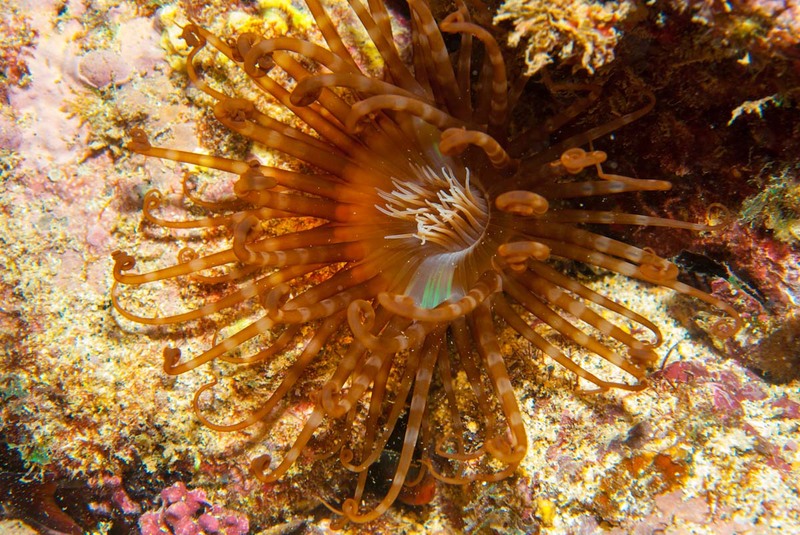 [caption id="attachment_469" align="aligncenter" width="584"] At night, the tube anemone, Isarachnanthus maderensis, can be seen in great numbers but it, too, has never been recorded from here. The sea anemone, Telmatactis cricoides, was known from St Helena island but not yet from Ascension. [caption id="attachment_466" align="alignnone" width="584"] A little fish (centre of image), the dragonet Callionymus bairdi, which lives on gravel and rather looks like a piece of gravel, is also a new record for Ascension Island. - Contributed by Peter Wirtz. Many years ago, Peter started as a blenny expert. During travels all along the coasts of the Mediterranean Sea and West Africa (from Morocco to Cameroon), he detected 10 of the 50 species currently known in that area (plus one from the Cape Verde Islands, which he is currently describing). Looking around (under water and on land), he noted many other fascinating critters and has now written papers on rather a lot of different species, from protozoans to Homo sapiens. Mysid shrimps - Karl Wittmann, Vienna, Austria. Brachiopoda - Bernhard Cohen, Great Britain, and Carsten Lüter, Germany. Gobiesocidae (Pisces) - Ron Fricke, Stuttgart, Germany. Lygdamis (Sabellariidae) - Eijiro Nishi, Japan. Zoantharia - James Reimer, Japan. Corals - Helmut Zibrowius, France, and Bert Hoeksema, Holland. Opisthobranchia - Michael Schroedl, Munich, Germany. Eulimidae (Gastropoda) - Anders Warén, Sweden. For this, he plans to do some night-time snorkeling in large tide pools (when cryptic opisthobranchs emerge) and to dive in caves (if any can be found).